Multipurpose areas require a multifaceted seating solution. 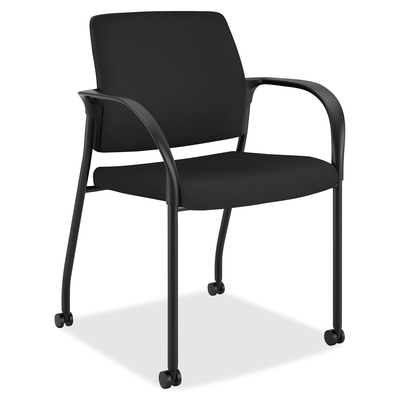 HON Ignition stacking chairs are the perfect answer for a variety of uses, and even better when the room isn't being used at all. Contoured back can make even the longest meeting more pleasurable, and the foam seat cushioning delivers all-day comfort for an all-day training session. Cushions on the seat and back feature Centurion fabric upholstery in black. When you need to clear valuable floor space, the lightweight, four-leg steel frame stacks four high. All-surface, dual-wheeled casters move as fast as you can, making rearranging a whole room a task for one. Wall-saver design is engineered to save both the chair and wall. Weight capacity is 300 lb. Stack up to four high. Seat size is 18" wide x 17" deep x 18" high. Back measures 18" wide x 18" high.